This style was born during the crisis of the Ancient Regime that provoked a loss of faith in Reason. As a reaction, a new sensibility came up. It was characterised by over valuating feelings, passion, intuition, imagination and individual. Romanticism is a way of feeling. -It uses different techniques: oil painting, watercolours, engraving and lithography. -Texture is valued per se and rough surfaces combine with more subtle shapes. Brushstrokes are free, alive and full of expression. -Line disappears in front of colour. The suggestive potentiality of colour is recovered, freeing from too defined limits. -Light is very important and its gradations give to the work and effective and theatre effect. -Compositions tend to be dynamic, full of curve lines and dramatic gestures, even when some artists prefer quieter geometrical schemes. -Subjects are varied, ranging from the exotic of the memory of a glorious pass –including from Greece to the Middle Ages –to history depictions. Gothic is the most important style, and its architecture, legends and historical moments are frequently depicted. The exotic is evident in the wide geography that includes the North of Africa and the wild new America. East is discovered, it offers the light and colour at once with new subjects. Fantasy and, above all, drama with an obsessive taste for death, night and remains, combined with monsters and non-normal creatures. Other discovery of the Romanticism is Nature and landscape. Fantastic, imaginative, of studio, remembered landscapes are depicted. Atmospheric effects such as fog are highly valued. The cult to individualism is reivindicated. Artists prefer their freedom to the collectivist. This is why just a few artists, as Delacroix, are compromised with their time. This individuality results in a new relation client-artist. They are equal, they exchange items. The artist is not the craftsman any longer. Sometimes artists create teams but without renouncing to their own individuality. Gericault is an artist who acted as a bridge between the Neo-Classical formation and a romantic approach to the work. In his short life he produced quite varied works of a wide range of subjects. 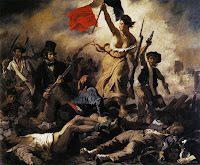 Delacroix is famous for his colour and sensuality. The North African painting influenced him. His work is of high compromise with History, and he represented moments of the revolutions of his times. Britain contributed to the painting of Romantic landscape with Constable and Turner. 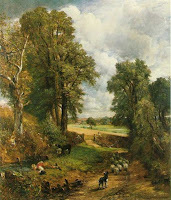 Constable’s landscapes are authentic and realistic. They are full of colour stains and he is worried about capsizing the effects of light and atmospheric changes through a quick and precise technique. Turner expressed his worries about colour and light, which he used in a revolutionary way by depicting the ways of expansion of this through the atmosphere: midst, steam, and smoke. 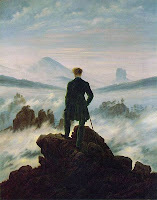 The most important artist is Caspar David Friedrich. He depicted landscapes to which he gave a mystic, religious appearance. People are only an insignificant element in front of the greatness of landscape.